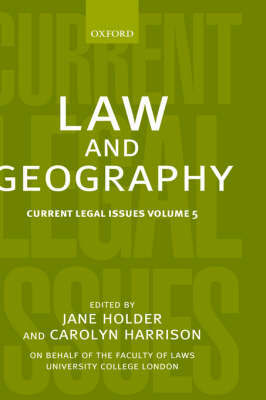 This volume explores the relationship between law and geography, especially with respect to taken-for-granted distinctions between the social and the material, the human and non-human, and what constitutes persons and things. As a genuinely reflective `Law and Geography' project, this collection offers interdisciplinary inquiry, particularly in response to globalisation - of law, commerce, environmental change and society - which renders relations between the local and the global more significant. Because of the sheer expansiveness and complexity of both law and geography we use conceptual frames to structure this volume - boundaries, land, property, nature, identity (persons, peoples and places), culture and time, and knowledge. These frames cut across the various subdivisions of law and geography described above and provide a route into the various practical and theoretical deliberations on the interrelationship and interstices of law and geography which follow. The chapters are diverse in style, research methodology, and subject matter (organ transplants, lawn mowing, settler states, archaeological remains, shopping, gay nightclubbing, seeds, common space).